September 4, 2016. By now, I’m sure you’re all very much aware of how seasick I get. So you’re probably wondering why in the heck I’d go to a boat show. Especially when just standing on a floating dock gets me queasy. The answer is: I had to satisfy my curiosity about the Norwegian national obsession with fancy yachts. From my vantage point near several of Oslo’s marinas, it seems like everyone and his brother owns a sweet ride for the water. 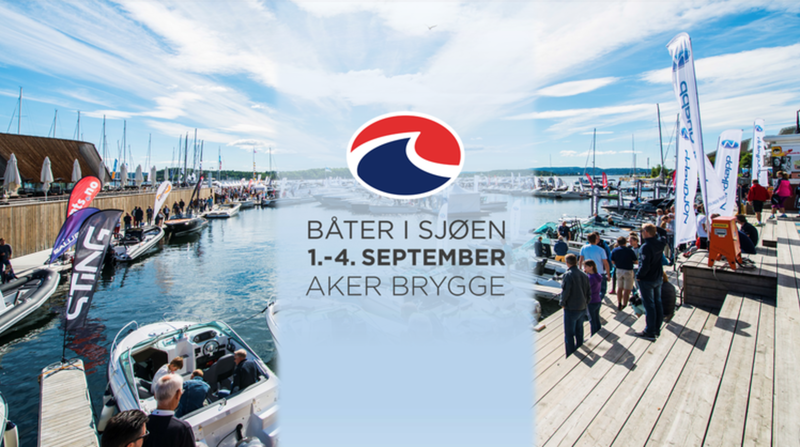 And the Båter i Sjøen (“Boats in the Sea”) show promised to reveal the full spectrum of luxury floatables available to the well-heeled Viking. Speaking of Vikings, they ruled the sea for centuries with good reason. In Norway alone, the total coastline — including islands and fjords — is 126% longer than that of the United States. 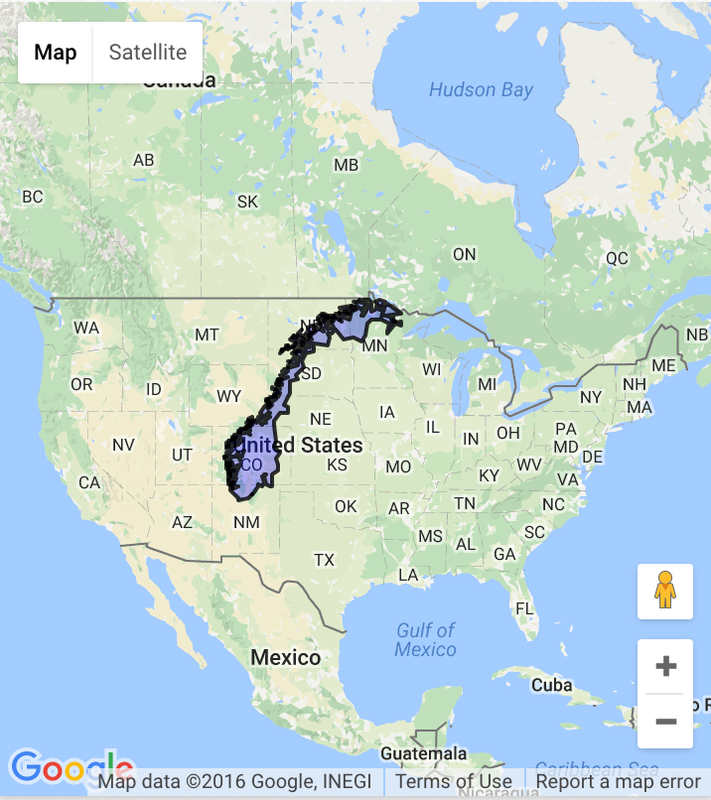 Yes, I mean the entire U.S. coastline, all the way around the country, is less than half the length of tiny Norway’s. (This odd factoid comes courtesy of your friendly, all-knowing CIA and their World Factbook.) Anyway, considering the amount of ocean-front territory across Scandinavia, you can understand why boats have always been a preferred means of transportation here. In fact, they’re still the fastest way to get to many heavily populated islands right near downtown Oslo. Check out the cute wooden boat from the 1940s — it’s called a “snekke,” or “sjekte” if you’re from southern Norway. These vintage models are still quite popular to own and are considered authentically “Norwegian,” as most are one-offs made by local boat builders. Maintaining all that exposed wood is fairly pricey and labor intensive, however. Check out a few more fun facts that I gleaned from the 2016 Pleasure Boat International Resource Guide. About 25 percent of Norwegian households own one or more boats, although in 2013, around 46 percent of the population reported having used a boat (via renting or borrowing their buddy’s boat, I’m assuming.) Estimates for the total number of boats in Norway are around 800,000, but it’s hard to keep count, since boat registration isn’t required. Nonetheless, these are pretty impressive stats for a country of only 5.2 million people. 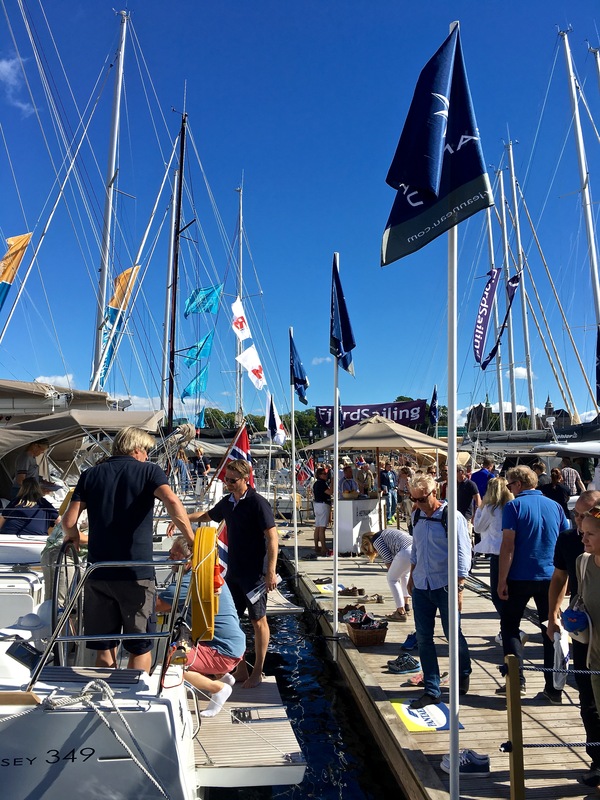 When polled about their most important reason to hit the water, 28.9 percent of Norwegian boaters responded “the nature experience,” followed by relaxation (23.4 percent), fishing (19.8 percent), and social interaction (16.6 percent). “Fast” sports like racing, waterskiing, and tubing accounted for a mere 3.6 percent. 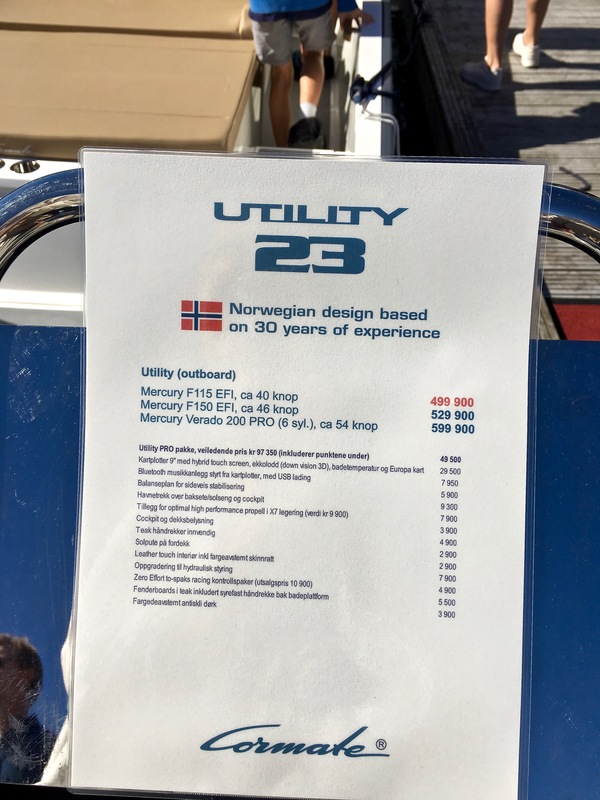 Clearly, Norwegians relish the more contemplative side of boating when compared to our American need for speed — an impression born out by the fact that the average Norwegian boat motor is only 30 horsepower, versus 100 hp for American models. 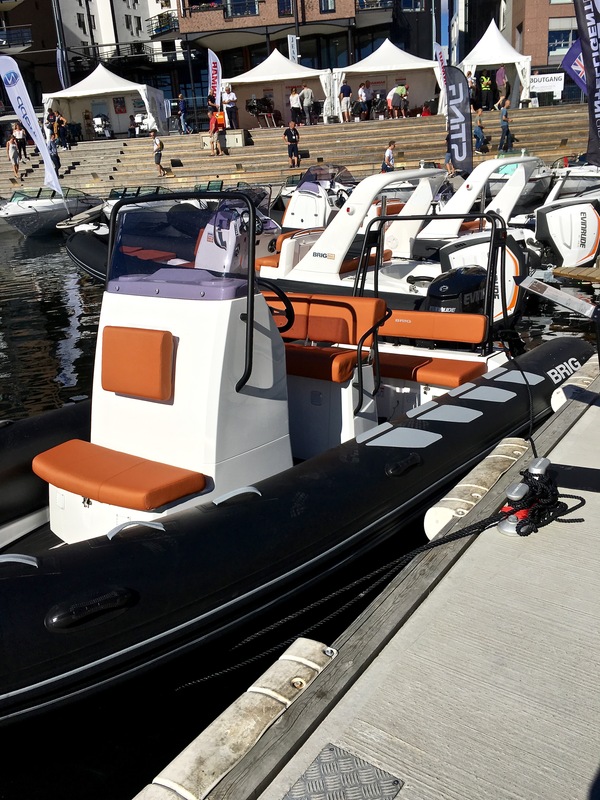 Despite this low vroom-vroom quotient, powerboats are still more popular in Norway than sailboats — I wonder if that statistic has Viking ancestors rolling over in their watery graves. Supposedly 14,577 people besieged the boat show this year. By the end of the day, the various docks seemed almost as crowded as Oslo’s streets on Norwegian National Day. Okay, now that we’re up-to-date on the basics, let’s get to the “Boats in the Sea“ event. 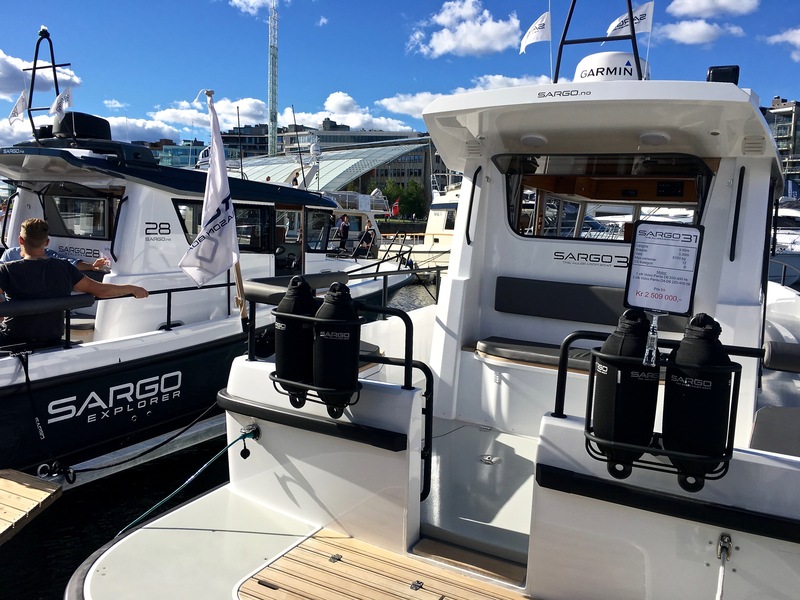 It’s supposedly Scandinavia’s largest outdoor boat show, with 270 models that you can tour (and purchase), and about 50 equipment exhibitors that can help you stock your new cruiser with all the posh accessories. Plus, it’s held at Aker Brygge — an old wharf that has been converted into a high-rent district with luxury condos, fancy shops, pricey restaurants, and museums. In other words, you can drop a crapload of cash in just a few hours, if you’re so inclined. Check out the number of boats in just this single row of slips. There were at least eight to ten more docks with an equal number of boats on show. In the background you can see some of Aker Brygge’s luxury condos. By the way, many of the condos come with their own boat slip — for an added cost, of course. Once you’ve purchased your yacht, consider buying a ski-do to keep on board for those moments when you’re bored with sunbathing. Ski-dos were only recently legalized in Norway, by the way. And of course, you must have the latest in pricey navigation systems for your oceangoing vessel. (You wouldn’t want to get lost at sea, would you?) These things are seriously complex — they have sonar, cartography systems, chart plotters, digital radar, you name it. I think I’d need classes just to figure out how to use the thing. The funky building in the background is the Astrup-Fearnley Modern Art Museum — a nice retreat if being on the bobbing docks makes you a bit bilious. 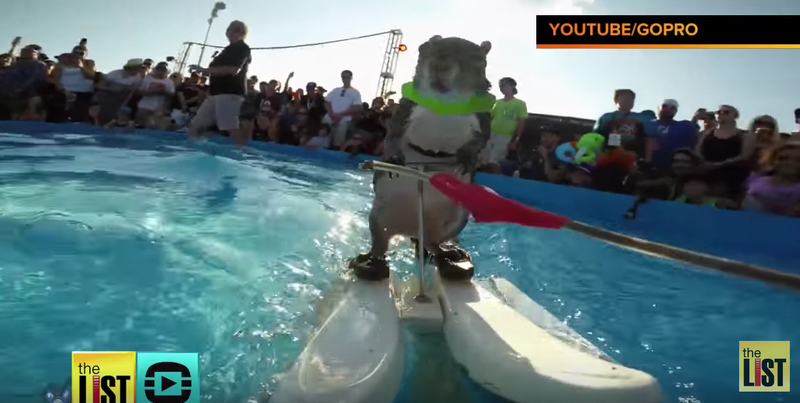 If you haven’t yet caught a performance of Twiggy, the Water-skiing Squirrel, then you’re missing a true slice of Americana. Check out the lineup of folks waiting to board the gorgeous sailboats on show. Beyond sheer scale, the “Boats in the Sea” event offers scenery and experiences that put all other shows to shame. 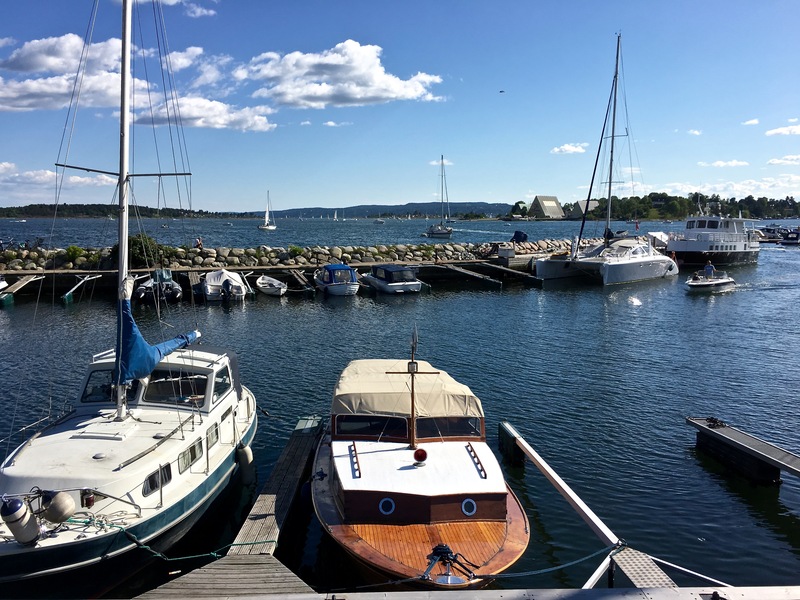 Each oceangoing beauty sits basking in the sunshine while bobbing along the gorgeous Oslo waterfront. You can don booties or shuck your shoes to climb over every square inch of your favorites — and even play with the various navigation systems, or raise part of the deck to get a closer look at an inboard motor. 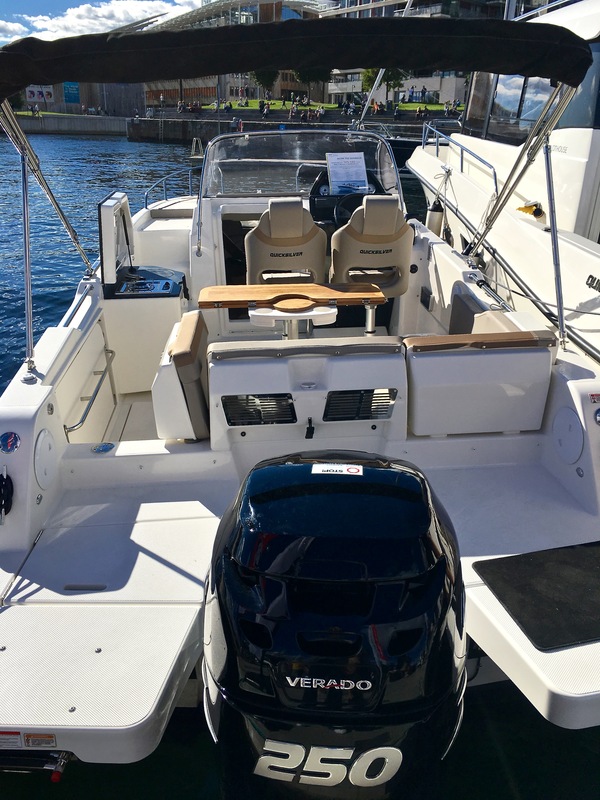 And, if you really want to get out on the water, you can book a test drive, sign up for a lesson with the Norwegian Sailing Federation, or take a kayak out for a cruise around the marina. But should your exertions exhaust you, liquor and lunch await in one of six dockside eateries erected just for the occasion. Volunteers from the Norwegian Maritime Museum greeted visitors aboard the RS “Colin Archer” and told stories about the rescue boat. Built in 1893, it’s credited with saving the lives of 274 people, rescuing 67 vessels from total loss, and giving assistance to another 1,522 vessels. The Oslo Kayaking Club outfitted newbies with all the necessary accoutrement and gave lessons. Plus, spectators could watch while kayak club members demonstrated the “Eskimo roll” and how to play kayak polo. By the way, notice the tiny girl paddling next to her mom — I’m always surprised by how much independence Norwegian parents give their kids. You’d never catch super anxious Americans letting their little ones do this. Kids could also try out a dingy or a stand-up paddle board. And the Norwegian Sailing Federation had a J/70 keelboat on hand to introduce active keelboat sailing. This model can be purchased on an installment plan of just 400 kroner (around 50 bucks) per month. Polishing up that all-important Norwegian tan is top priority for day cruisers like this Quicksilver Active Sundeck 755. They typically come with a swim deck off the back of the boat, a sun deck in the bow, and sometimes even pop-up lounge chairs. And of course, you’ll need a fridge for chilling the beer, and a sink and stove for cooking up the day’s catch. Matthew and I spent our first hour at the show simply strolling the docks and comparing classifications of boats with those that are popular back home. In short, it seems that the U.S. and Norway share an affinity for day cruisers and luxury yachts. (Check out some of the stunners we toured in the gallery further below.) But that’s pretty much where the commonalities end. Missing were the ubiquitous bass boats that I’m used to seeing in droves at boat shows, and on every lake and river in the States. I’m guessing they’re too shallow to handle ocean swells but might be useful for Norway’s inland lakes, where freshwater salmon, perch, trout, and Arctic char can be found. 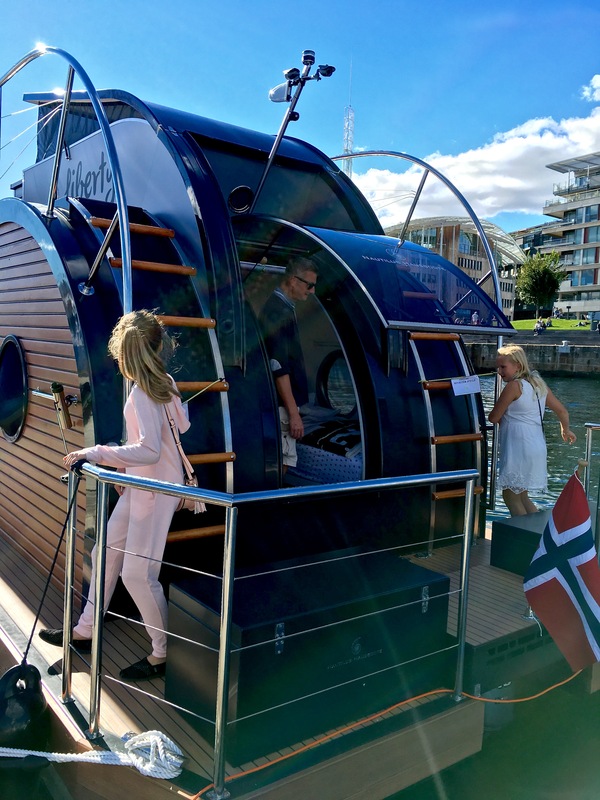 Nautilus Scandinavia launched the Liberty at the boat show. Its award-winning design sleeps four, is environmentally friendly, and is intended to help “solve the housing crisis on land” with a price point of a mere $200,000. Another surprisingly limited category were the houseboats, with only one uber-mod version on display. Same with the so-called cigarette boats. They’re the favorite toy of silver-backed, middle-aged males in Chicago, who race up and down Lake Michigan’s shoreline trying to prove their Viagra-enhanced virility. But I saw only a single speedster for sale at the Oslo show, and it looked like it had few takers. Maybe Norwegian men are more secure in their masculinity — or maybe it’s just that they don’t relish paying the high gas prices and ridiculous taxes that come with owning two 1,000+ horsepower engines. 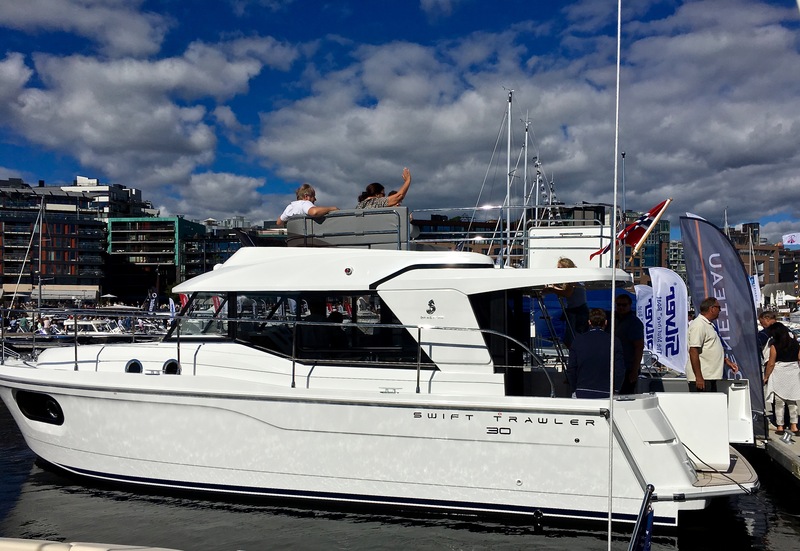 Not to mention that Norwegians definitely seem to prefer boats that can provide a relaxing and full day of socializing for enormous groups of family and friends. Pounding the waves for a couple of hours at top speed with ear-deafening volume to impress just a handful of people doesn’t appear to be their style. Just a quick pic of the Liberty houseboat’s awesome front deck / kitchen dinette area. I could see myself trading in our condo for summer living aboard this cutie. If only it weren’t for that pesky floating part. The gorgeous Xc 38 was the 2011 European Yacht of the Year in the Luxury Cruiser category. Below deck, it has two swanky sleeping cabins, a big bath with a separate shower, and a huge saloon with a kitchen galley and lounge area that seats six. Pretty sweet, if you can afford the $365,000 USD price tag — and if you know how to sail. The Xc 38 comes with a futuristic Navistation and chart table, plus two wheels to steer the rudder. I found out that two wheels are pretty standard on racing yachts nowadays. That’s because, when you’re “hard into the wind” (meaning when you’re at top speed and the wind causes the boat to lean heavily to one side), you can use the wheel that’s on the highest side. This lets you sit higher up so that you can see the jib sail in front. Plus it also allows you to counterbalance the lean of the boat with your weight. Norwegians loooooove wooden boats, and Chris Craft is still producing models with high-end vintage elegance, stunning woodwork, and agile powerboat handling. The Princess 43 Motor Yacht is classed as a “superyacht” — at the super price of $660,000 USD. I like to think of it as the ultimate party barge, with a deck (and bar) in back, on the bow, and up top. While the Princess 43 has an interior main bridge, Matthew prefers the impressive flybridge up top, ’cause it lets you catch some rays while driving. I’ve already staked out my territory on the top deck and am pretending I’m in an episode of Lifestyles of the Rich and Famous. One of the two posh bathrooms. Our condo bathroom isn’t even this fab. For folks who really enjoy big families and long fishing trips, the Swift Trawler accommodates eight in style and comfort with three double cabins, two lounges with galley kitchens, multiple bathrooms, a flybridge with a top sun deck, and a heating/ventilation system. Probably the largest parade of potential new rides we inspected belonged to a class of long-distance cruisers that I’ve seen only on the Discovery Channel and in National Geographic: trawlers and pilot houses. (Think of a hybrid between a spiffed-up version of a fishing boat from World’s Deadliest Catch and an upgraded tugboat). Both are designed for days, and even weeks, of living on board while island-hopping and fishing. They come equipped with everything you need, from kitchens with grills, microwaves, washing machines, and dryers, to saloons with TVs, wet bars, and stereo systems. Designed by Russian ex-military aeronautical engineers, Brig RIBs are made of Hypalon — the same stuff that the landing tubes for Russian space vehicles are made from. The material is super buoyant and incredibly resistant to UV and chemical damage. And while we’re talking about sailing in rough seas, I’ll mention one more boat that you don’t see much of in the States: the RIB (Rigid Inflatable Boat.) I’m used to these Zodiac-styled pontoons from my days at The Field Museum; they’re favorites of scientists who regularly use such raft-like craft for beach landings in remote locations. But I was surprised to see so many of these part-boat / part-balloon-animals at the Oslo event. Matthew and I stopped to talk to one vendor about why RIBs are so popular in Scandinavia. “Price, passenger accommodation, power, and seaworthiness” he said. “They start as low as $10,000 USD and can fit from 6 -16 people depending upon the size. Plus, they’re fast and can get you to Stockholm in about three hours, Copenhagen in maybe four. And they’re much more comfortable and safe than a traditional boat because the tubes act like giant cushions. At high speeds, these babies skim the top of the water; they don’t bounce and slam into the waves like a standard hull. Plus, they don’t tip to one side when people climb aboard or change seats,” he bragged. 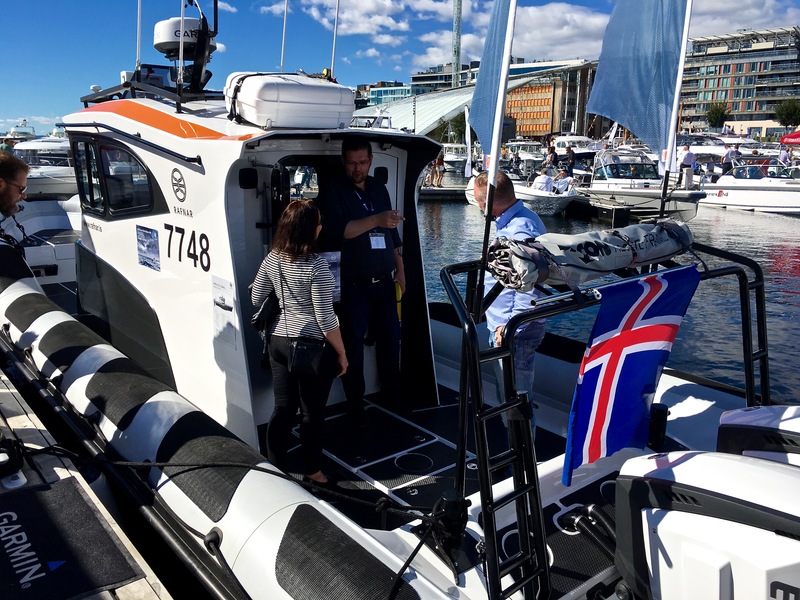 Check out Rafnar Shipyard’s Leiftur 1100 Explorer RIB, developed in close co-operation with the Icelandic Coast Guard. They sailed it 1,300 nautical miles from Iceland to Sweden in the roughest seas imaginable to prove how tough it is. Hmmm…. traveling to other countries quickly by sea — and not aboard one of those 8-hour barf barges they call a cruise boat? Sign me up! Suddenly, the idea of boat ownership seemed appealing to us. But then the guy continued, “These boats are great in rough seas. When you get out into the area between Sweden and Denmark, where the North Sea and Baltic Sea meet, it’s as if somebody laid down the paving pretty badly there. You can get extreme choppiness and 8-meter swells (that’s a two-story-tall wave, people!) — and yet these boats stay beautifully stable.” Umm, maybe, but I’ve seen the spot he’s talking about from the relative safety of an airplane, and it’s nothing I’d like to tackle in the equivalent of a fancy life raft. But when we moved onto the next vendor, we again felt the seduction of the sea. 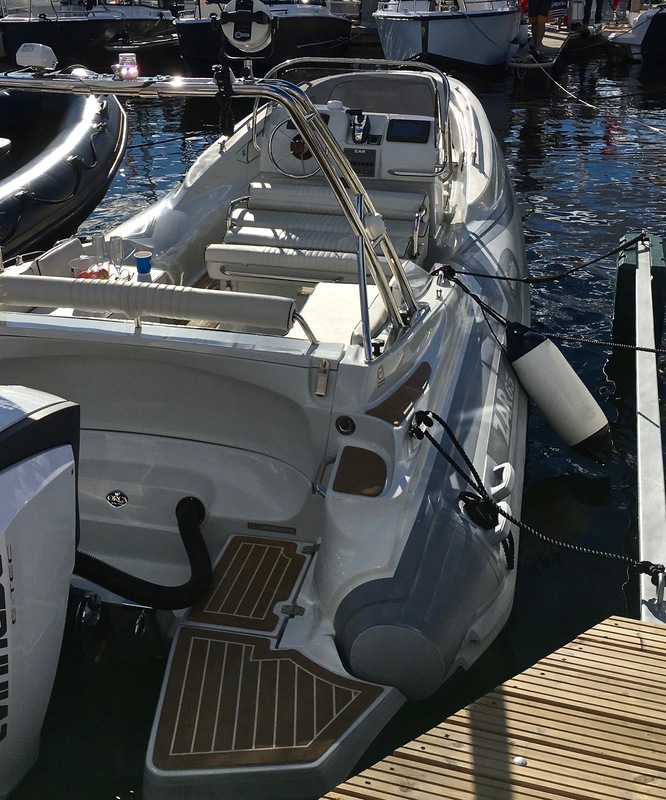 The Zar Formenti 65 seemed to offer the best of both worlds — a combo of RIB and conventional hull that still offered stability, but with lots more room for suntanning and socializing. Plus the sleek Italian design, white leather seats, and the bottle of chilling champagne nearly had us smack a SOLD! sticker on the thing. But then in talking price, the vendor continued, “Of course, you’ll have to add on fees for boat insurance, slip rental, a trailer, towing fees, and winter storage.” Cha-ching, cha-ching … and, we’re out. Needing to experience something reasonably affordable, we scooted next door to Matstreif (“Food Walk”). 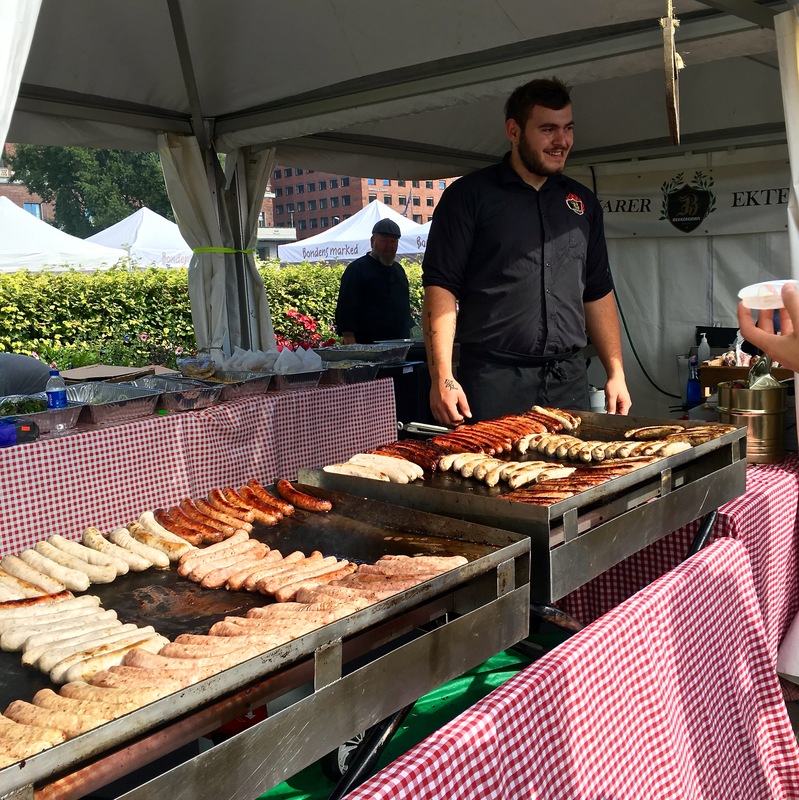 It’s a huge Norwegian food festival held every year in September, in front of Oslo City Hall right next to Aker Brygge. Food distributors, fish vendors, and farmers come out in full force to give tourists and locals a taste of traditional Norwegian foods, from salmon served raw, smoked, or rotten (called Rakfisk, it’s considered a fermented delicacy) and reindeer meatballs and steaks, to homemade cheeses and produce grown by neighborhood co-ops. So to close this lengthy post, here’s a gallery of edibles. No, you may not have a bite of my bratwurst, biotch! I can’t figure out how Norwegians stay so skinny when they make (and eat) so many delicious pastries. This is standard breakfast fare and coffee-break fodder for many. But I will say that their sweets are much less sugary than American pastries, allowing the flavor of the fruit or cheese to really shine. The apple harvest is a big deal in Norway. Many places bottle apple juice and sell it like wine at restaurants, each farm with its own special brew. Candied apples are a standard Christmas treat, too. Corn is another hugely popular veggie — Norwegians put in on everything, from salads to tacos to gyros — it’s practically a standard topping. Hey lady — that’s for kids. This guy lives on a small island in Oslo’s fjord that has no running water or electricity. He raises goats and makes unbelievably buttery goat cheese, then brings it to market via boat. The Sami people from up north of the Arctic circle brought some reindeer meat to the party and showed various ways to prepare it. Matthew and I took home a passel of recipes and several reindeer steaks. Trying on some reindeer antlers for size. Reindeer pelts for sale — hey kid, you pet it, you buy it. Salmon prepared ten different ways — all were yummy. I brought some smoked salmon home and made salmon quiche using fresh dill and goat cheese from the food fest.